(Nanowerk News) The biggest thing in operating rooms these days is a million-dollar, multi-armed robot named da Vinci, used in nearly 400,000 surgeries nationwide last year — triple the number just four years earlier. But now the high-tech helper is under scrutiny over reports of problems, including several deaths that may be linked with it, and the high cost of using the robotic system. There also have been a few disturbing, freak incidents: a robotic hand that wouldn't let go of tissue grasped during surgery and a robotic arm hitting a patient in the face as she lay on the operating table. Is it time to curb the robot enthusiasm? Some doctors say yes, concerned that the "wow" factor and heavy marketing are behind the boost in use. They argue that there is not enough robust research showing that robotic surgery is at least as good or better than conventional surgeries. Many U.S. hospitals promote robotic surgery in patient brochures, online and even on highway billboards. Their aim is partly to attract business that helps pay for the costly robot. The da Vinci is used for operations that include removing prostates, gallbladders and wombs, repairing heart valves, shrinking stomachs and transplanting organs. Its use has grown worldwide, but the system is most popular in the United States. The da Vinci surgical system. "We are at the tip of the iceberg. What we thought was impossible 10 years ago is now commonplace," said Dr. Michael Stifelman, robotic surgery chief at New York University's Langone Medical Center. For surgeons, who control the robot while sitting at a computer screen, these operations can be less tiring. Plus robot hands don't shake. Advocates say patients sometimes have less bleeding and often are sent home sooner than with conventional laparoscopic surgeries and operations involving large incisions. But the Food and Drug Administration is looking into a spike in reported problems. Earlier this year, the FDA began surveying surgeons using the robotic system. The agency conducts such surveys of device use routinely, but FDA spokeswoman Synim Rivers said the reason for it now "is the increase in number of reports received" about da Vinci. Reports filed since early last year include at least five deaths. Whether there truly are more problems lately is uncertain. Rivers said she couldn't quantify the increase and that it may simply reflect more awareness among doctors and hospitals. Doctors aren't required to report such things; device makers and hospitals are. It could also reflect wider use. Last year there were 367,000 robot-assisted surgeries versus 114,000 in 2008, according to da Vinci's maker, Intuitive Surgical Inc. of Sunnyvale, Calif.
Da Vinci is the company's only product, and it's the only robotic system cleared for soft-tissue surgery by the FDA. Other robotic devices are approved for neurosurgery and orthopedics, among other things. — A woman who died during a 2012 hysterectomy when the surgeon-controlled robot accidentally nicked a blood vessel. — A Chicago man who died in 2007 after spleen surgery. — A New York man whose colon was allegedly perforated during prostate surgery. Da Vinci's maker filed that report after seeing a newspaper article about it and said the doctor's office declined to provide additional information. — A robotic arm that wouldn't let go of tissue grasped during colorectal surgery on Jan. 14. "We had to do a total system shutdown to get the grasper to open its jaws," said the report filed by the hospital. The report said the patient was not injured. — A robotic arm hit a patient in the face during a hysterectomy. Intuitive Surgical filed the report and said it's not known if the patient was injured but that the surgeon decided to switch to an open, more invasive operation instead. Intuitive Surgical filed all but one of those reports. Complications can occur with any type of surgery, and so far it's unclear if they are more common in robotic operations. That's part of what the FDA is trying to find out. Intuitive Surgical disputes there's been a true increase in problems and says the rise reflects a change it made last year in the way it reports incidents. The da Vinci system "has an excellent safety record with over 1.5 million surgeries performed globally, and total adverse event rates have remained low and in line with historical trends," said company spokeswoman Angela Wonson. But an upcoming research paper suggests that problems linked with robotic surgery are underreported. They include cases with "catastrophic complications," said Dr. Martin Makary, a Johns Hopkins surgeon who co-authored the paper. "The rapid adoption of robotic surgery ... has been done by and large without the proper evaluation," Makary said. 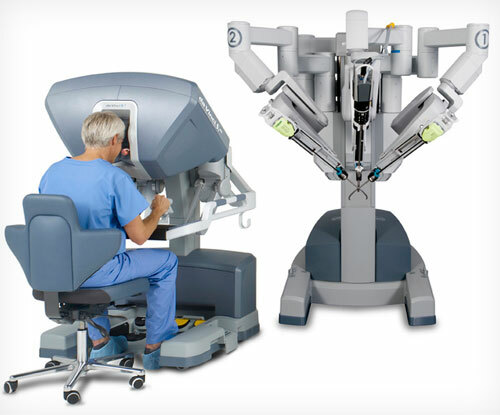 The da Vinci system, on the market since 2000, includes a three- or four-armed robot that surgeons operate with hand controls at a computer system several feet from the patient. They see inside the patient's body through a tiny video camera attached to one of the long robot arms. The other arms are tipped with tiny surgical instruments. Robotic operations are similar to conventional laparoscopy, or "keyhole" surgery, which involves small incisions and camera-tipped instruments controlled by the surgeon's hands, not a robot. Almost 1,400 U.S. hospitals — nearly 1 out of 4 — have at least one da Vinci system. Each one costs about $1.45 million, plus $100,000 or more a year in service agreements. The most common robotic operations include prostate removal — about 85 percent of these in the U.S. are done with the robot. Da Vinci is often used for hysterectomies too, Wonson said. Makary says there's no justification for the big growth in robotic surgery, which he attributes to aggressive advertising by the manufacturer and hospitals seeking more patients. He led a study published in 2011 that found 4 in 10 hospitals promoted robotic surgery on their websites, often using wording from the manufacturer. Some of the claims exaggerated the benefits or had misleading, unproven claims, the study said. Stifelman, the Langone surgeon, said it makes sense for hospitals to promote robotic surgery and other new technology, but that doesn't mean it's the right option for all patients. "It's going to be the responsibility of the surgeon ... to make sure the patient knows there are lots of options," and to discuss the risks and benefits, he said. His hospital expects to do more than 1,200 robotic surgeries this year, versus just 175 in 2008. For a few select procedures that require operating in small, hard-to-reach areas, robotic surgery may offer advantages, Makary said. Those procedures include head and neck cancer surgery and rectal surgery. Some surgeons say the robotic method also has advantages for weight-loss surgery on extremely obese patients, whose girth can make hands-on surgery challenging. "At the console, the operation can be performed effectively and precisely, translating to superior quality," said Dr. Subhashini Ayloo, a surgeon at the University of Illinois Hospital & Health Sciences System in Chicago. Ayloo, who uses the da Vinci robot, last year began a study on the effectiveness of robotic obesity surgery in patients who need a kidney transplant. Some hospitals won't do transplants on obese patients with kidney failure because of the risks. In the study, robotic stomach-shrinking surgery and kidney transplants are done simultaneously. Patients who get both will be compared with a control group getting only robotic kidney transplants. "We don't know the results, but so far it's looking good," Ayloo said. Aidee Diaz of Chicago was the first patient and was taken aback when told the dual operation would be done robotically. "At first you would get scared. Everybody says, 'A robot?' But in the long run that robot does a lot of miracles," said Diaz, 36. She has had no complications since her operation last July, has lost 100 pounds and says her new kidney is working well. Lawsuits in cases that didn't turn out so well often cite inadequate surgeon training with the robot. These include a malpractice case that ended last year with a $7.5 million jury award for the family of Juan Fernandez, a Chicago man who died in 2007 after robotic spleen surgery. The lawsuit claimed Fernandez's surgeons accidentally punctured part of his intestines, leading to a fatal infection. The surgeons argued that Fernandez had a health condition that caused the intestinal damage, but it was the first robot operation for one of the doctors and using the device was overkill for an ordinarily straightforward surgery, said Fernandez's attorney, Ted McNabola. McNabola said an expert witness told him it was like "using an 18-wheeler to go the market to get a quart of milk." Company spokesman Geoff Curtis said Intuitive Surgical has physician-educators and other trainers who teach surgeons how to use the robot. But they don't train them how to do specific procedures robotically, he said, and it's up to hospitals and surgeons to decide "if and when a surgeon is ready to perform robotic cases." A 2010 New England Journal of Medicine essay by a doctor and a health policy analyst said surgeons must do at least 150 procedures to become adept at using the robotic system. But there is no expert consensus on how much training is needed. New Jersey banker Alexis Grattan did a lot of online research before her gallbladder was removed last month at Hackensack University Medical Center. She said the surgeon's many years of experience with robotic operations was an important factor. She also had heard that the surgeon was among the first to do the robotic operation with just one small incision in the belly button, instead of four cuts in conventional keyhole surgery. "I'm 33, and for the rest of my life I'm going to be looking at those scars," she said. The operation went smoothly. Grattan was back at work a week later.